Okonkwo is not an immediately likable character but you are quickly drawn into a deeply empathetic relationship with him and his tribe. You become used to the magical thinking of the villagers and the importance they attach to appeasing the spiritual world. The cruel things that are done become more palatable when you understand they are done for good reasons. The author achieves this empathy without making any concessions to a European reader. There is no interpretation. You are simply told what Okonkwo and the other characters are thinking through straight forward exposition within the narrative. I loved the details of village life and how they are conveyed matter-of-factly, without any long descriptive passages. We learn each man has his own hut and his wives sleep in separate huts within their husband’s compound. Men definitely have it easier than the women, who do much of the work. Okonkwo, having three wives, never has to cook for himself but he does have to eat three evening meals – one prepared by each wife. Looking after the yam crop, however, is the responsibility of the husband – because yams are a man’s crop. Hospitality is important. No matter how poor the villager, offering his visitor a kola nut seems to be part of the ritual. Conversation is valued as a past-time, involving a great deal of convoluted speech as the tribe has a propensity for speaking in proverbs. An impending marriage requires a complex bargaining process to secure the correct price for the bride. 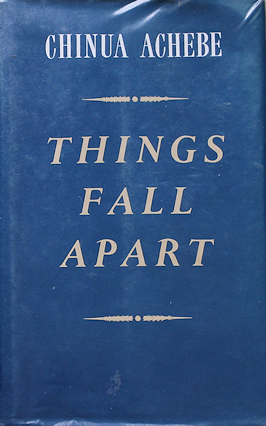 The author does not shirk from showing us some of the hard realities of African village life; where wives are beaten for disobeying their husbands, where twins bring bad luck and are abandoned to die in the forest, where the gods may need appeasing through acts of horrible violence and cruelty, and where a failed harvest can bring famine and death. This is not a sentimental portrayal of a primitive idyll. The story jumped between characters. We start with a description of Okonkwo and then, almost immediately, go into a long tale of his father, before going back to Okonkwo. Later on, we follow one of the wives and then she is abandoned by the narrative as a different wife takes centre stage. This takes some getting used to but is, I gather, typical of African writers. The book is short. Well worth reading.